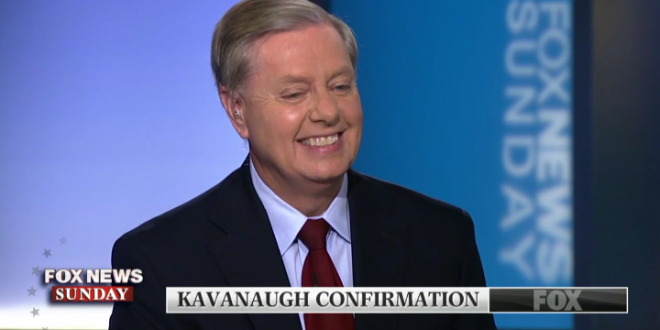 Graham On Kavanaugh: "I'm As Happy As A Clam" - Joe.My.God. “I’m happy because the effort to railroad and humiliate and railroad a man I’ve known for 20 years, failed. I’m happy that those who destroyed his life fell short. I’ve never been more pissed in my life. I voted for Sotomayor and Kagan. I would’ve never done this to them. This was character assassination. This was wanting power too much, and to the extent that I came to the aid of this good man and helped defeat this debacle, I’m happy as a clam. All I can say is this is going to the streets at the ballot box.” – Sen. Lindsey Graham, speaking this morning on Fox News Sunday.
.@LindseyGrahamSC: I’ve never campaigned against a colleague in my life, that’s about to change.